This is a brilliant piece of work. And from a artist so young! Double wow! Wow–impressive. Such skill to not only capture how he looked, but also so much more. Thanks for sharing, Beth! I am bowled over by the talent of Shania McDonagh. 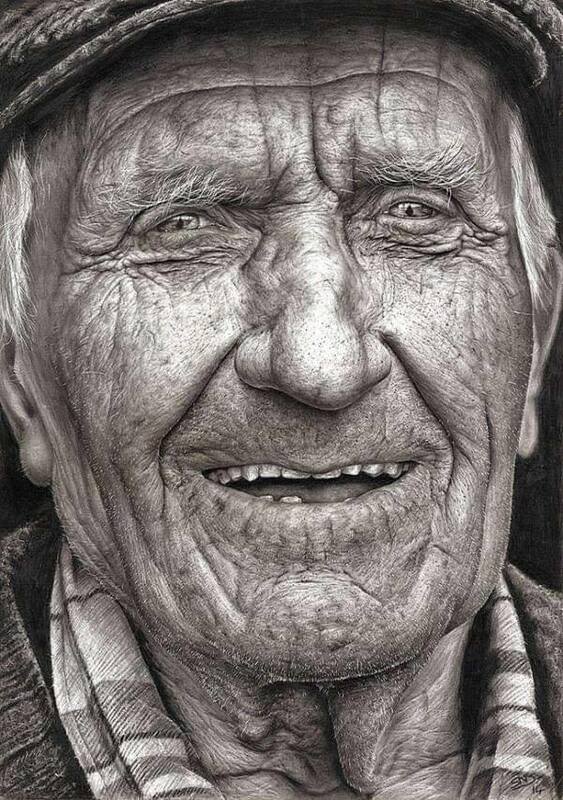 I don’t think that I have ever seen a pencil drawing that is anywhere near as good as this one. My Mum was very talented, but even she would concede that Shania is one-hundred times her better. My Mum was mainly a musician: piano. She played at the top level as a classical pianist before moving across to jazz and improvisation. She played with many of the top British trad jazz bands of the sixties and seventies. The only line drawing that I think I can find of hers is a sketch that she made, a la Hoffnung, of the Dolmetsch family as they played at a chamber music concert that we went to in Scotland. Carl Dolmetsch signed it with a message to Mum. You can read a bit about her if you search for “June” in the search box on my blog. Then search for “Hitchcock.” It’ll make you chuckle! I am bowled over by the talent of Shania McDonagh. I don’t think that I have ever seen a pencil drawing that is anywhere near as good as this one. If YOU have, please tell me about it. Better still, share it with us. My Mum was very talented, but even she would concede that Shania is at least one-hundred times her better. This warms my soul this morning. Thanks for sharing, Beth! Very cool. Love the drawing and the quote. Amazing talent! Thanks for sharing Beth! Incredible! And how wonderful that through this portrait the young artist has kept Mr. Coyne’s memory alive. Wow!! I’ll be looking out for her work – what a breathtaking talent. Appreciate you sharing this very much! oh, my god! THANKS! I really needed this! you are telepathic or something! It just doesn’t seem possible. The skills on that gal! So impressive! Thanks for sharing this! What does that say about plastic surgery! No more lines in the future! So many they can’t smile or move their eyebrows! Unbelievable! At first I thought it was a photograph! I can’t pick up my jaw!!! Wowza!!!! Wow! I can’t believe that’s not a photograph! I love “a story in every line.” So true! Oh.My.Goodness. That is a stunning piece of artwork. An amazing work! Such fine detail work!